Problem: How can I very quickly become familiar with a complex Inventor part model? Solution: Use this ‘Feature Player’ to quickly play through all the part features to discover how it has been built. Of course there are various ways of familiarising yourself with a part file, but sometimes the most helpful can be simply to ‘play’ through each of the part features in turn from first to last. And this isn’t too demanding to do manually – just drag the ‘end of part’ marker down one feature at a time. However automating this with iLogic will be much quicker and will save us valuable time. So hence this simple iLogic ‘Feature Player and Rename’ tool. Why renaming as well? 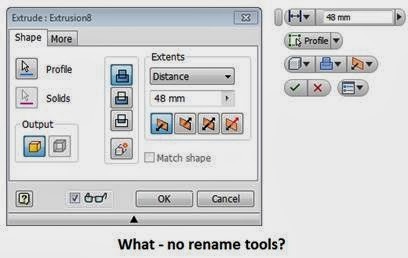 Well as – surprisingly - there’s no way to rename features (something other than generic ‘Extrusion1, Revolve1 etc) as part of the feature creation process itself…..
….it might be nice to have the option of renaming each feature in turn with the feature player. This could save us some time, and also make future interrogation and changes to the part easier, if the features are given meaningful names. So without further ado – to watch the video showing the player in action, please click on the picture at the top of the blog. Ps. As usual be careful when copying and pasting the iLogic code. If you paste spaces between the lines then the code may throw up some errors when you run it, so be sure to remove these spaces if required. Download the code for the player below and watch the video for more info. Hey Luke, wheres the link to download the code? Code added above, we must have missed it off when we migrated over from our old site!